If you're think of buying your child a tablet to keep them busy over the summer vacation this guide should help you to pick the right one. We'll go through the best options for learning tablets and Android based tablets that you can buy now. But if your child would make good use of a tablet over the summer for entertainment and education purposes then waiting for the new models isn't convenient. One option to consider is buying a used tablet, Amazon usually has a choice of pre-played with tablets to choose from. You can also consider selling the tablet when the new models come out and upgrading. 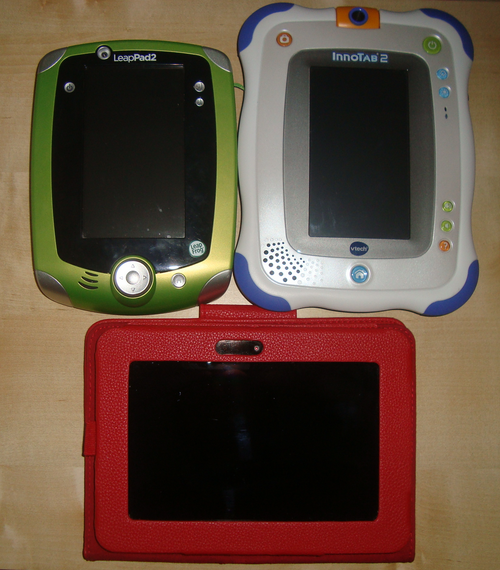 Image: The tablets my kids use regularly. Excuse the fingerprints. We'll start with learning tablets for a younger age group and work our way up. The LeapPad 2 is is a learning tablet for kids aged around 4-8. It's a good choice to prepare kids for school or help them learn to read and develop other key skills. My younger son has the green one and uses it regularly - he's nearly 5. It's very well designed with a good choice of fun and educational titles. It works with cartridges or downloads which you transfer from a computer using the provided cable. There's a new LeapPad Ultra model coming out in the fall which adds Wifi syncing and other capabilities. If you think you'd like to wait for that model then consider the new LeapReader pen which has just come out. The InnoTab 2S is an updated model that came out in late 2012 and adds Wifi sync capability so you don't need to connect to a computer to download new content. We're likely to get an updated InnoTab for 2013, but we don't have details yet. At time of writing this tablet is very good value on Amazon. The Kindle Fire isn't specifically a kids tablet, but it does have lots of features and content for kids. It has pretty good parental controls (much better than when it first came out) and it's easy to use. We have the 7" HD version. There is a cheaper non-HD version, but the HD one has a higher spec and is a bit more future-proof. There's the Kindle Fire Freetime Unlimited subscription service which gets you access to lots of kid friendly apps, videos and books which can save money and time trying to find suitable content. The Amazon free app of the day is often kid-friendly, we've built up a good library of apps this way. Amazon have got into a routine of releasing new tablet models in time for the holidays. The current range of Kindle Fires are plenty good enough for kids so your main risk in buying early is that the price of the older models will drop. But if your child will use the tablet a lot over the summer and fall then it may still make sense to buy now. A cheap Android tablet under $100? This is probably obvious, but if you go for a cheaper option then set your expectations accordingly. Having said that, the Matricom .TAB Nero offers good value for money in this category, if you really need an inexpensive option. It comes in a choice of colors too. Just make sure you consider parental controls and consider installing an Android parental controls app. This is a new budget tablet which came out earlier in 2013.